My parents have saved A LOT of pictures of Heather and I throughout the years. I love these old photographs because it was before the era of digital cameras and these images really capture how long ago life was. Recently I picked out a few of my favorite photos and scanned them on to my computer. 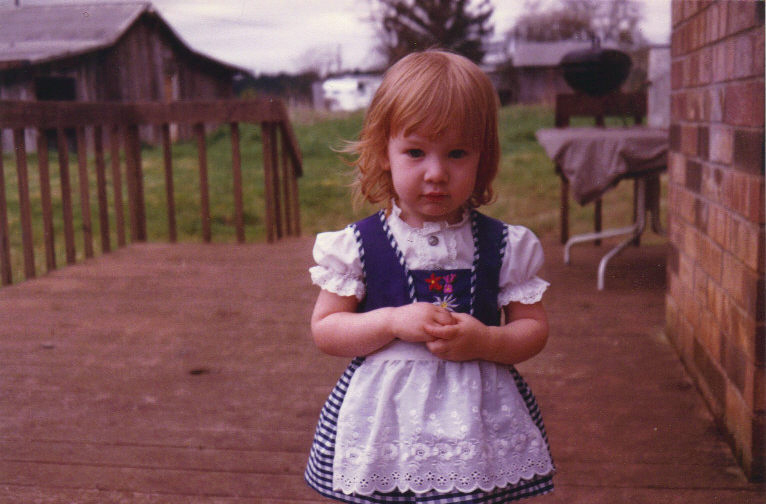 Heather and I had a wonderful time growing up in the country with a lot of property to run around, climb trees, ride our bikes and play with our animals. We had a LOT of animals throughout the duration of our childhood... horses, pigs, cows, pygmy goats, bunnies, kitties, doggies, gerbils, chickens... You name it, at some point we had it! 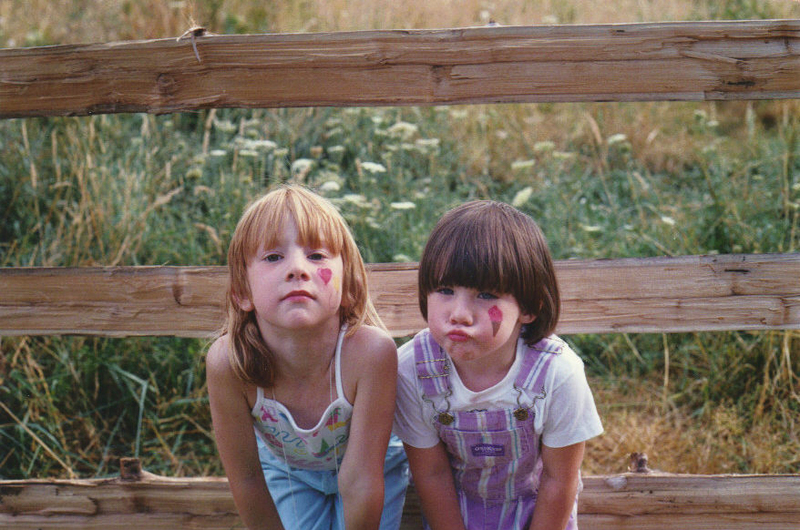 Here are some pictures that I think really capture what life was like for Heather and I when we were little! Stacey, Heather & me. 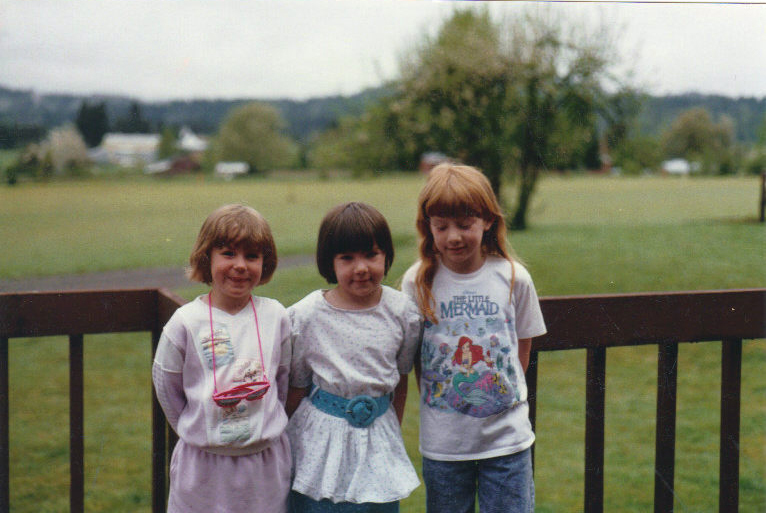 [Stacey was one of Heathers' best friends growing up] I was super excited about "The Little Mermaid" at this point in my life. This is right when the movie came out I was even more excited because A) my middle name is Ariel and B) I had long, red, wavy hair. You can bet that I was bragging to everyone about this. 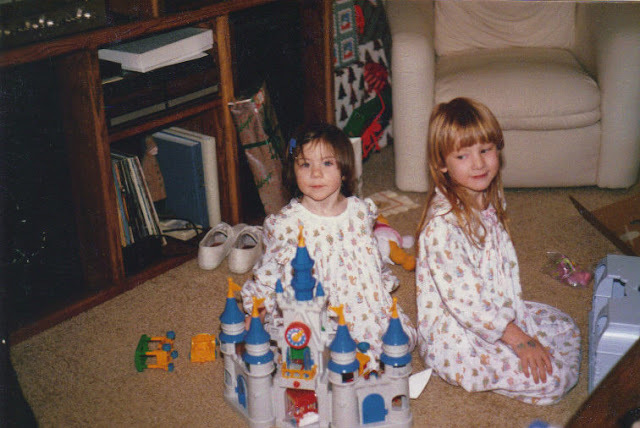 Heather and I are super excited for Christmas presents, obviously! 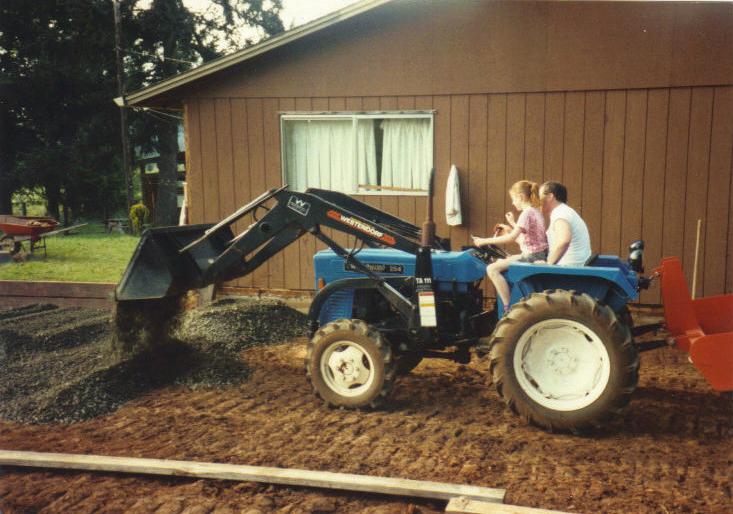 My dad and I on the tractor. We're adding on a new addition to our house and he's letting me "think" that I'm helping him out. 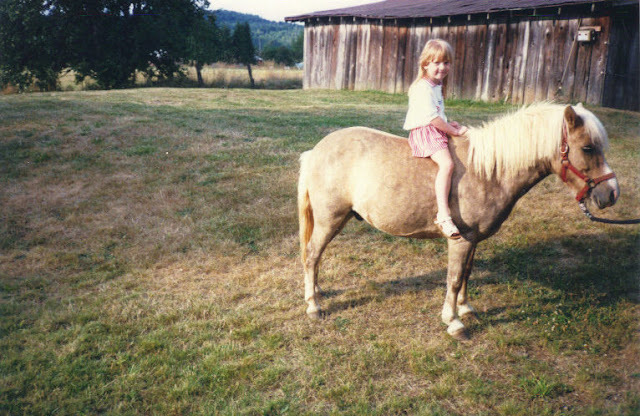 Ever since I was a tiny, tiny girl, we always had horses. 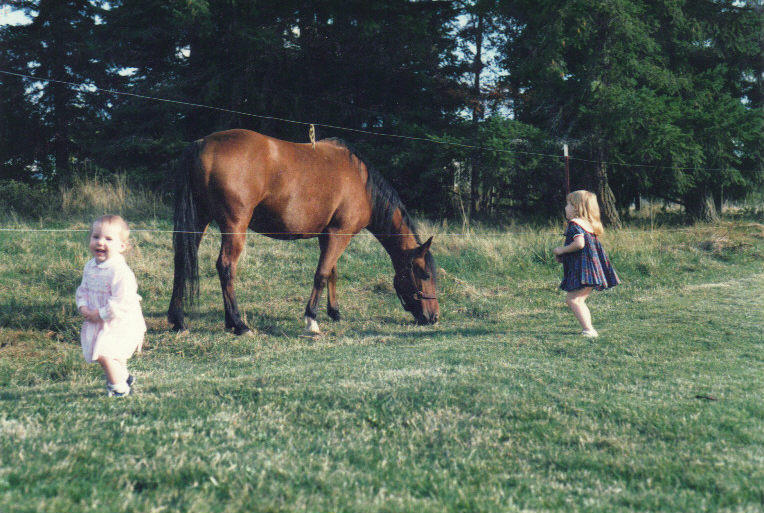 I even got my first horse [Capser] when I was 18 months old! This is me with my pony, Charlie. How cute is this mini horse?! 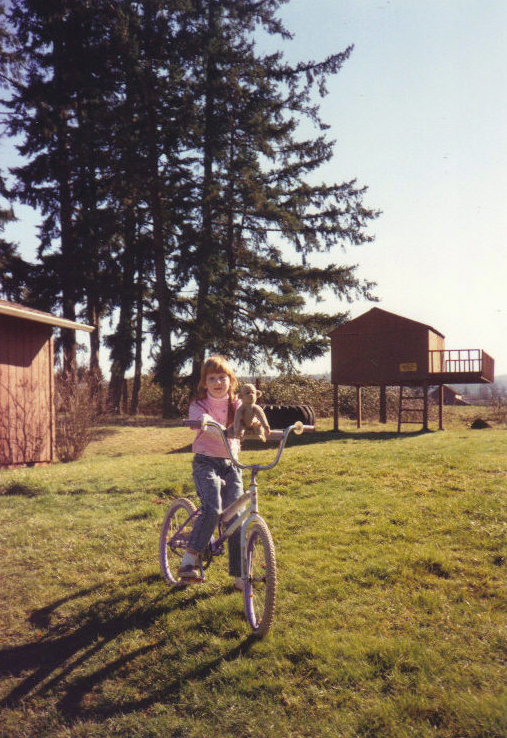 Growing up we had a lot of property around our house; it was the perfect setting for riding our bikes everywhere! This is me riding around with my favorite stuffed animal, Monkeykey. I still have this monkey and sometimes he sleeps on my bed. I remember one time my dad yanked him out of my hands when we were playing around; he pulled on him a little too hard, tearing his arm right off. I cried and I cried! My mom stitched him right back up, but I could always see the stitches and always felt bad for the little guy.